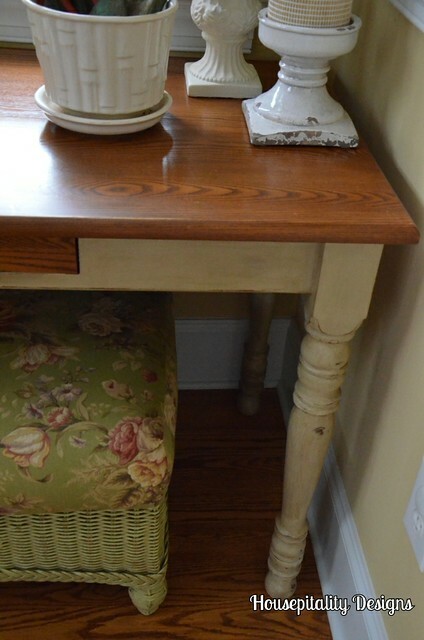 ….I had to find a place for the oak desk that we have had for years (and years). So I decided to paint it…. 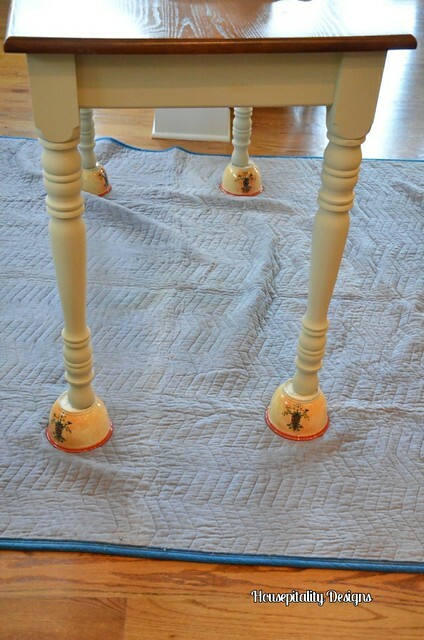 I used Annie Sloan Chalk Paint/Country Grey with both clear and dark wax. I had it on a high ledge in the living room…unless you looked up..no one really noticed it. It was on clearance!..a great deal and had to have it. …..my hubby was carrying this beauty…and it was a long walk to the car! What a guy! As you can see, I kept the desk top the original oak stain, along with the drawer. While on a shopping trip with Amy, Kristen (and her mom and daughter too), and Suzy…. 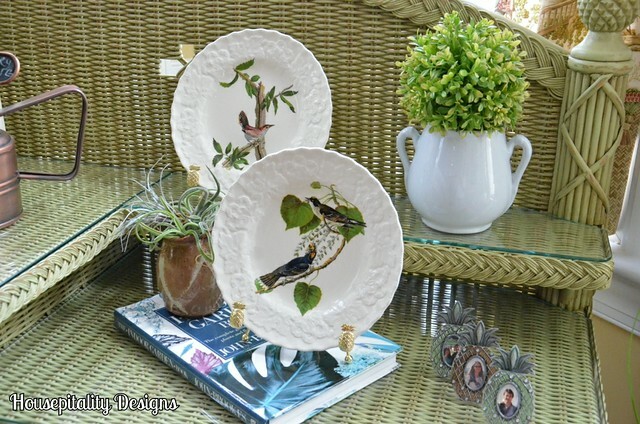 …..I came upon these great bird plates…I love a bird motif!! These plates are part of an Audubon Series by Alfred Meakin/England. They were a bargain at $9.00 each. The other side of the potting bench/cabinet proudly displays my watering can and seed packets from Mary..
…..just waiting for Spring to be planted. Hurry Spring!! …..it was in one of the guest bathrooms. Had to place a bookshelf in that bathroom..
……….to accommodate the craft furniture. 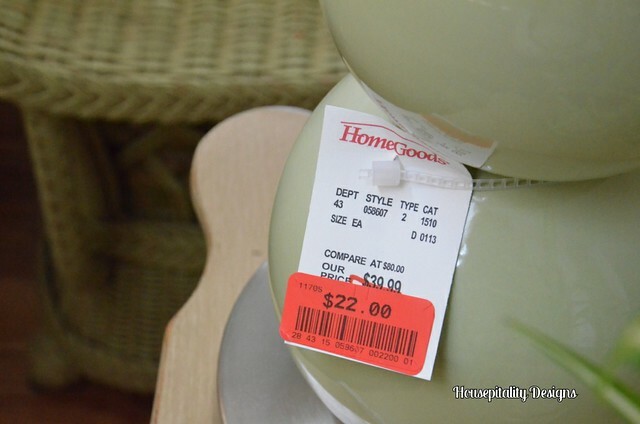 I had a small lamp on the previous table in that spot…really needed a larger lamp…so off to HomeGoods I went. After wheeling my cart through the several aisles in the lighting section…I turned the corner to the last aisle..
….the clearance aisle..and the angels sang…score! 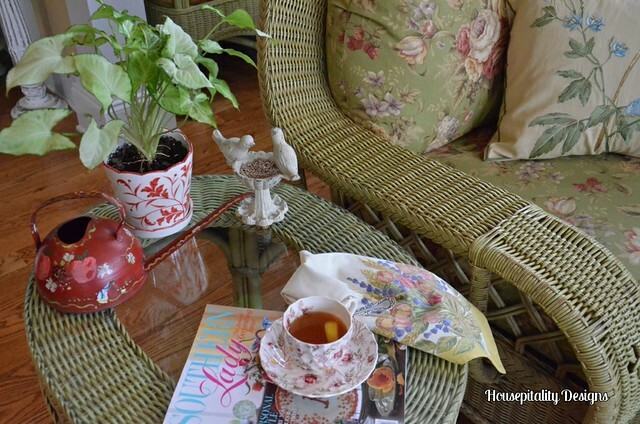 …..a convenient spot for my reading material and a great cup of tea. 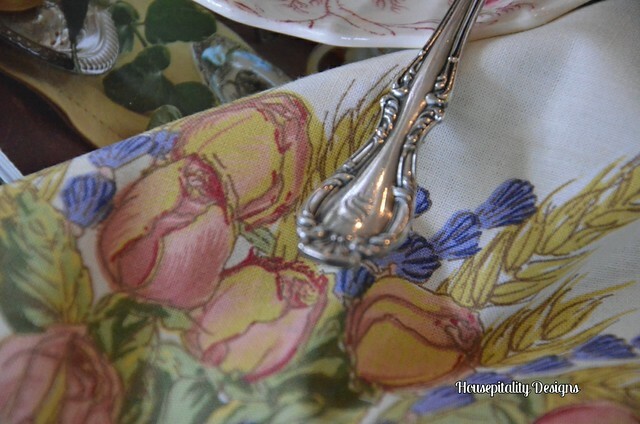 …..she goes to France and I get napkins!…I will bring her back one this year!! I love silver spoons and try to gather ones with my initial. …..just doing some tweaking in the kitchen. Shirley, I need to come to your neighborhood yard sale! 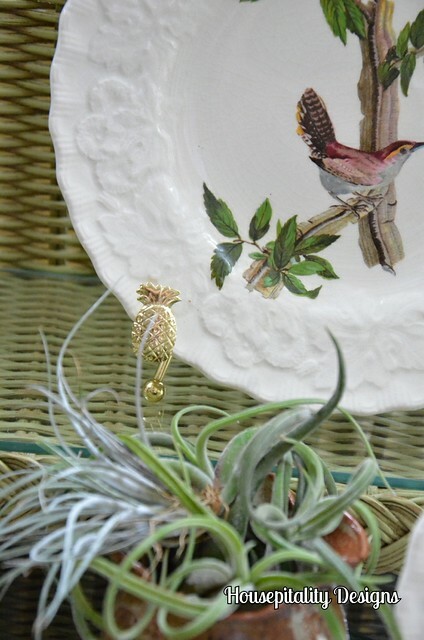 Love the tray and your tole painted watering can! 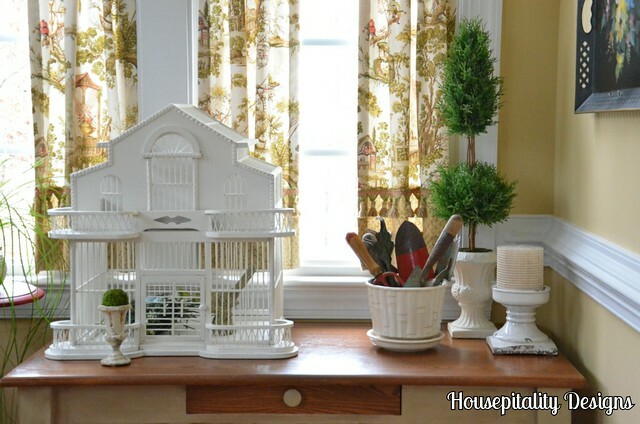 Your painted table turned out lovely…so many things to ooh & aah over in your sunroom! I love your Audubon plates too! I meant to ask before but how do your trays hang on the wall? I need a way to hang mine other than with an oversize plate hanger, I don’t like the way they hang. Thanks for letting me know about your trip to France~ I would love to go but I’m afraid my hubby would protest if my first trip there was without him 🙂 I’m sure you’ll find lots of treasures! I’d say that it landed in the perfect spot. What a saint hubby is to haul that thing while you shop around the streets of Va. Good man, great woman, fantastic changes to the room. Love the changes. The desk fits perfectly there. Wonderful plates you found. I love anything with birds especially with spring coming back soon. Looking at your room makes me long for spring and maybe we will make it to France if we can stop shopping. Oh what a delightful way to open my eyes this morning and see this lovely sunroom. That table looks uber charming Shirley. 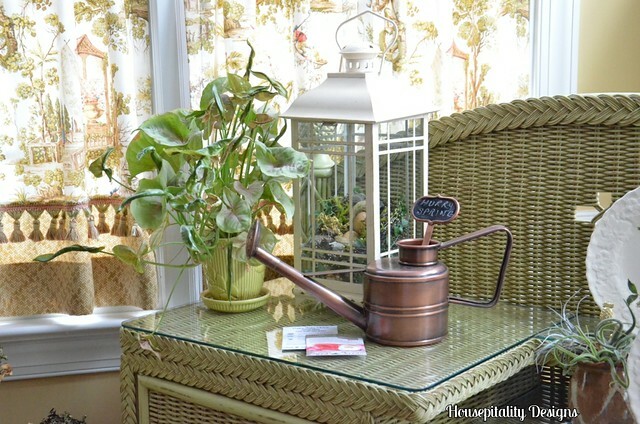 I also love the copper watering can. Shirley I love how you painted your table. It stands out and says look at me!! I envy your sun room, especially here where we have just had a horrific snowstorm over a foot dropped yesterday. Our temps are -21 cooolllldddd. 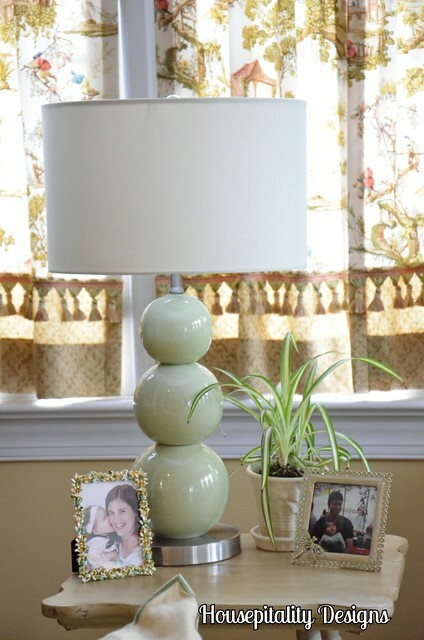 The newly painted desk looks wonderful in your sunroom, Shirley. I love the vignette that you created on top. I forgot that you bought those bird plates – I love them! 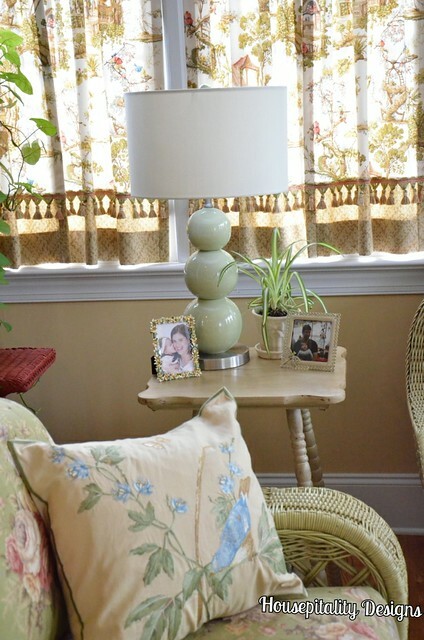 I love seeing your sunroom, Shirley! The desk worked out great in here. 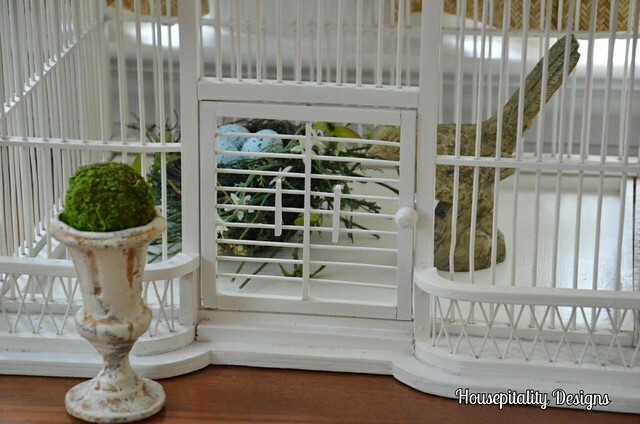 That birdcage is beautiful. 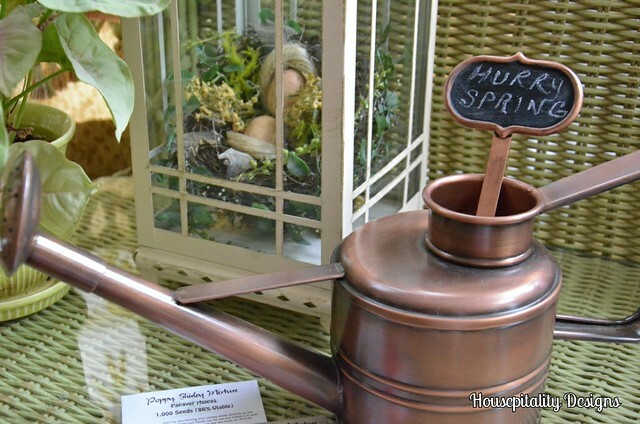 Love the little urn, too. 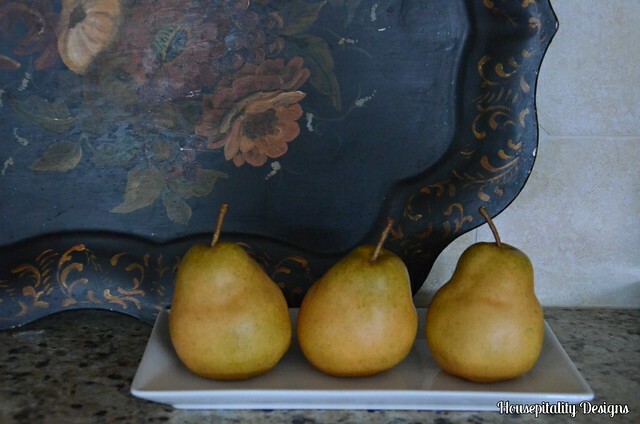 Kathy @ Creative Home Expressions’s recent post…New Blog Header! It is eye candy,,,for sure! English garden cozy! I fell in love with your sun room when I first saw it … and it only continues to get better with every little change you make! 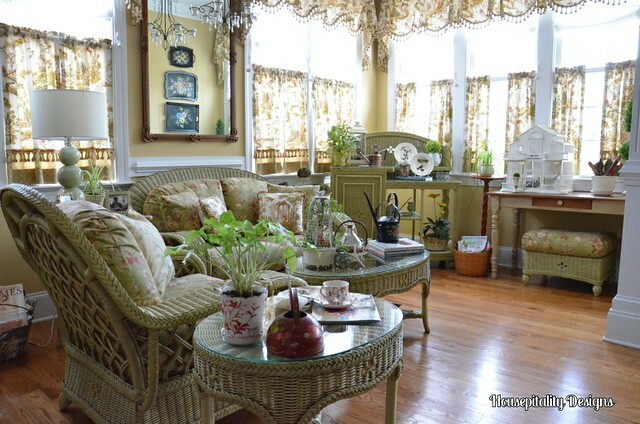 Shirley, I love your post, I love your home, and most of all I love your sunroom. I too have a nice sunroom. Our room is done is reds and some yellow and green. Very tropical looking and I like it just fine. 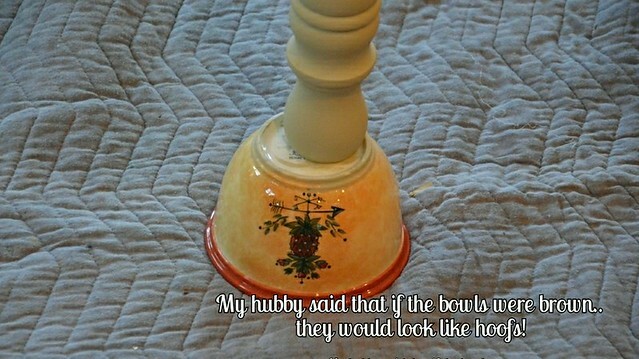 However…if I had seen your room first before I started decorating I would have used your colors instead. 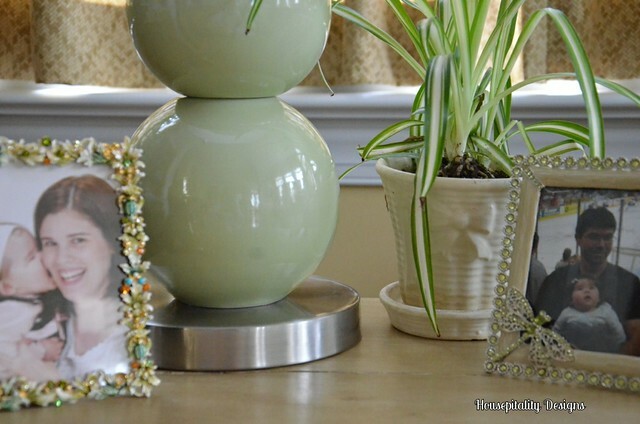 I think your room is so relaxing and calm with all the bird decorations and beautiful plants. Your are amazing. Thank you so very much for sharing your home. God bless you and your family. Well, if I am resourceful…I will try and find a Hermes Outlet!! ha!! !…and you know pretty napkins can make great scarfs!! Quite a successful transformation on the desk. 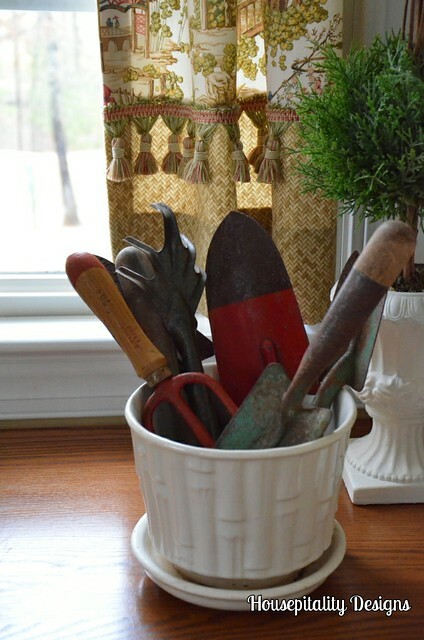 With all your finds and tweaks, you must be about to run out of around the house projects. Everything you add is a special touch. Here you are! Hi there!!! So THIS is what you’ve been up to! Great job! I really do wish I had the fortitude to pull out a paint brush and go to town on my furniture, but I’m just leery of what ruin I might bring. 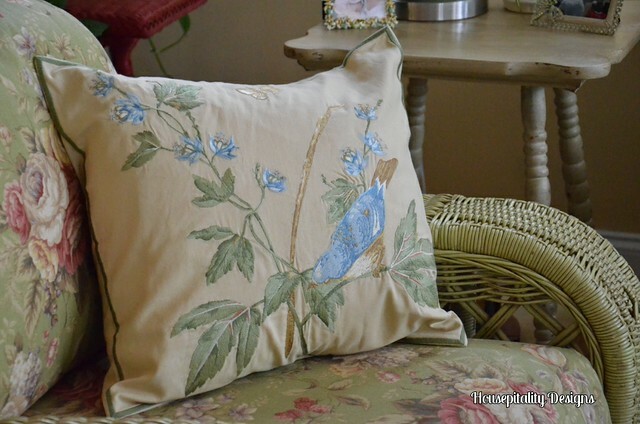 I’m such an impatient little person when it comes to projects…which is why I have a hard time with sewing, too! 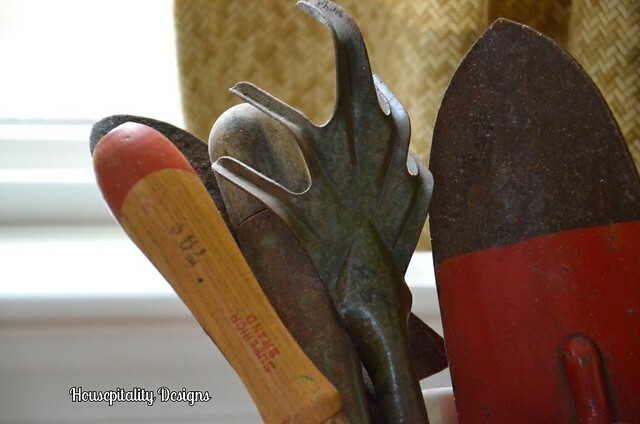 It’s hard to believe any sturdy garden tool like that was once only 79 cents! We were just at the hardware store, and a similar one now costs somewhere around $8!!! I hope you’re able to find another miniature urn. The one you have is super cute! Looking real good Shirley, I love the desks makeover, very pretty!! 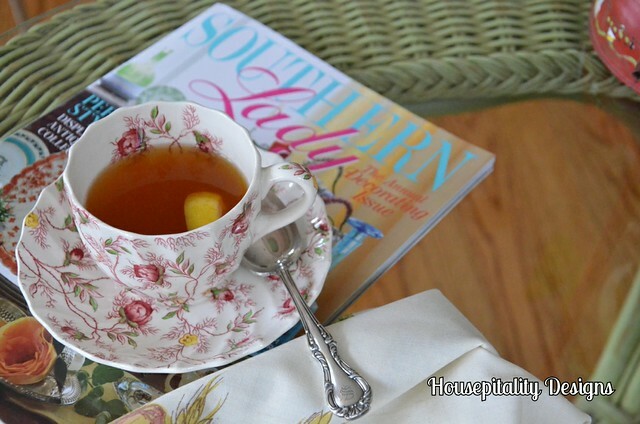 I need to come to your yardsales, I LOVE that tole tray! Wow, it’s so cozy, even more than before! Love everything about this warm, sunny room. Thanks for sharing. Beautiful job! I need to go back to using chalk paint, the texture is so much more interesting than latex paint!!! What a happy room and I cannot believe all of the bargains! 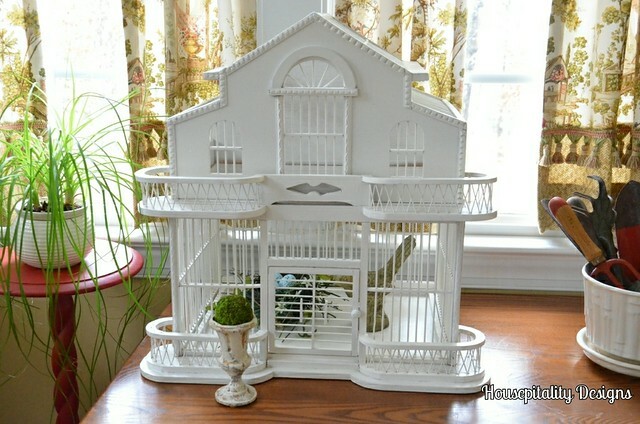 Love the bird cage and those bird plates ( I have a bird “thing”, too). You did a beautiful job – thanks for giving us a peek! What a beautiful room. You have added so many lovely touches. You did a good job in every room of your house here! I can feel the green nature in each room. I was planning to have a green theme in celebrating my Valentines this coming February 14 and thanks for sharing it. I have now an idea of green themes. Thumbs up! 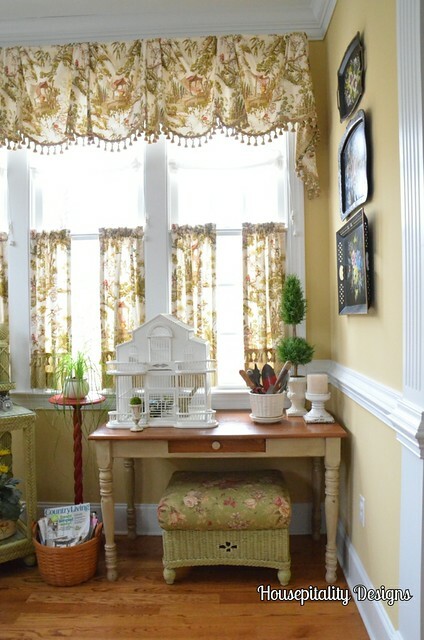 Your sunroom is so lovely! Your oak desk looks so pretty wearing its new coat of paint. 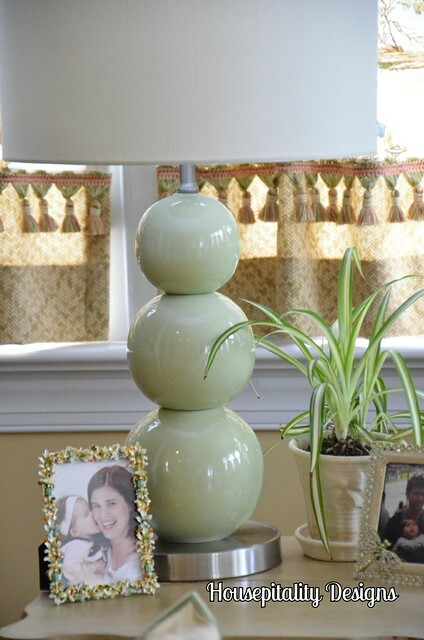 You accessorized it so perfectly for that room too. It definitely has a garden feel in there. oh, i just LOVE this room!! I love birds and cheery rooms so I think this room is a huge hit with me! I love the yellow on the walls. What is the color? I think I want to paint my room that color. Everything looks beautiful as always! I love the spring theme in this room. So light and fresh. 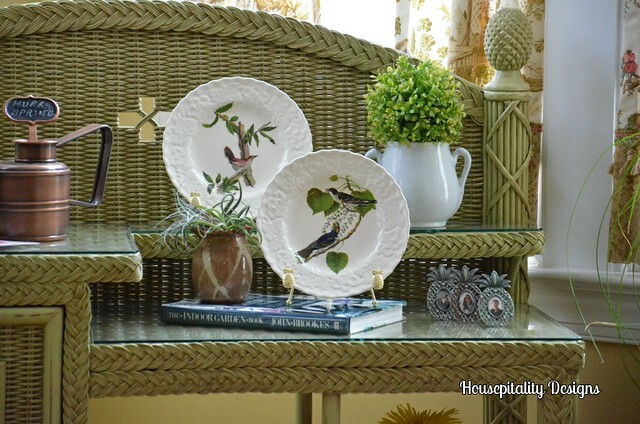 Those are the prettiest bird plates! I like what you did with the table Shirley and I love that you left the top dark. I used to collect toleware and I love the tray. Wow! These are some truly gorgeous sunroom additions. 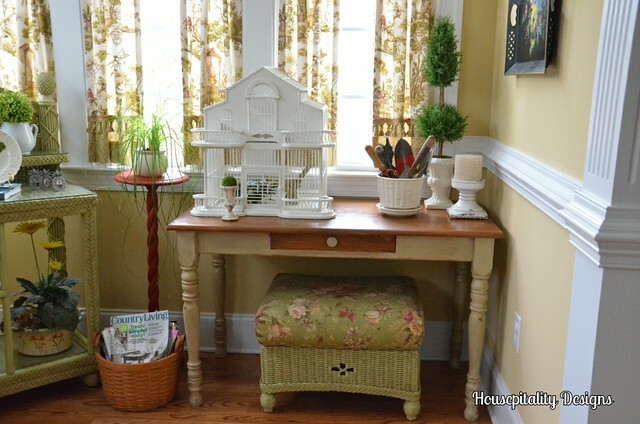 I especially love your bird cage and the freshly painted oak desk! 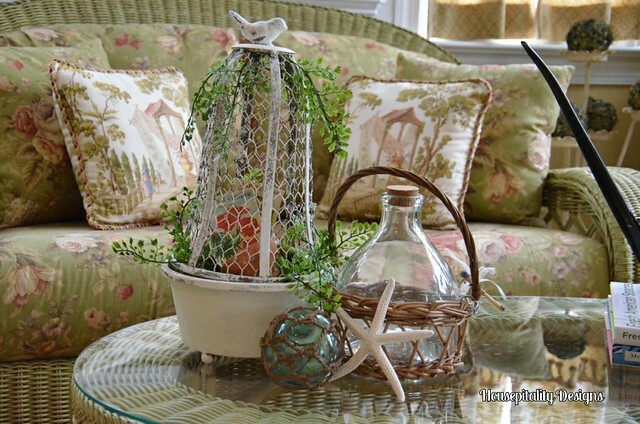 I’m glad I visited this page, it has inspired me add some embellishments to my sunroom as well! Thanks! Shirley – how lovely and inviting! 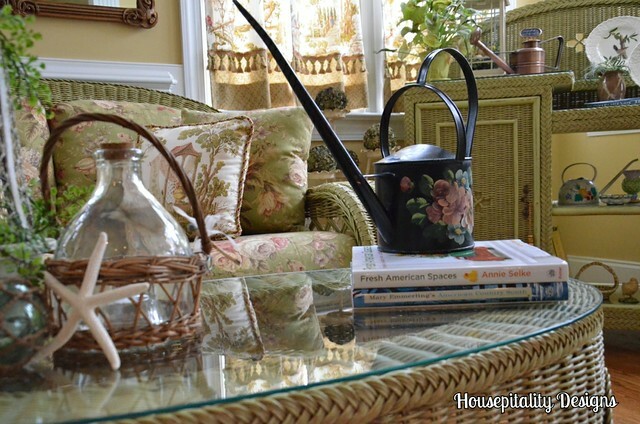 Every detail in your sunroom is simply charming. Thanks for all the inspiring pictures – so many great ideas!